Evening Performances March 30 - April 13, Matinees March 31 - April 14, Sing-A-Long April 11. A mother. A daughter. Three possible dads. And a trip down the aisle you'll never forget! In this jukebox musical, the story-telling magic of ABBA's timeless hits drives this enchanting tale of love, laughter, and friendship. On the eve of her wedding, a daughter's quest to discover the identity of her father brings three men from her mother's past back to the island they last visited 20 years ago. 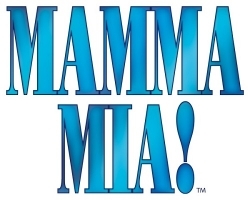 Laughs, fantastic singing, funky costumes, a live band, and snappy dance numbers combine to make Mamma Mia a night to remember! There are Matinee and Evening performances. Click the "Buy Ticket" link to choose your Date and Time. For Tickets to the Sing A Long go to the listing for that event. For Groups of 10 or more call the Box Office at 530-885-0156.